Shimano Nexus 3-speed hubs -- current production, 2017: Uh Huh. The current (2017) generation of Shimano 3-speed internal-gear hubs is available with a coaster brake or with an optional external Rollerbrake or disc brake. The coaster brake is only suitable for flatland use: it will overheat on long downhill runs, like any coaster brake. The Rollerbrake also is somewhat prone to overheat, though the newer high-power model is less so, with its finned heat sink. The disc brake gets very hot but is made to withstand the heat. With any of these brakes, a front brake also should be installed -- see my article about braking and turning. Bicycle manufacturers often assume that the middle gear of a 3-speed hub is the "normal" gear. They fudge a bit, lowering the gears in order to keep the top gear from being completely useless, but then the middle gear is too low for level-ground riding. A 3-speed hub will work better for you if you change the sprocket or chainwheel to lower all the gears, so you use the top gear on level terrain. The low and middle gears are then better for acceleration and climbing, too. See the article on internal-gear hubs for detailed advice. Various Nexus 3-speed models have overlocknut dimensions between 127 and 135 mm. These are listed for most hubs in the hub dimensions document linked below. It is usually possible to spread the rear triangle of a steel (Cromoly) frame to the needed width. Any good bicycle mechanic will be able to do this, or you can do it yourself. Most Shimano 3-speeds use a bellcrank and pushrod for shifting, rather than a pulley concentric with the axle. With these hubs, the orientation of the axle does not affect shifting, and oil lubrication is possible by removing the bellcrank and pushrod, then squirting oil into the hollow end of the axle. The Nexus 3-speed bellcrank is aligned in second gear. The yellow line on the paddle should be between the two yellow arrows. Torque on the axle from the gear train is relatively low, and so the bellcrank-shifting hubs use only one non-turn washer, at the left side. The installation instructions specify a yellow washer, type 5R, for the coaster-brake version of the hub to place the axle with its round sides in the edges of the dropout slots. This is normally a right-side washer (so, the "R") but is shown on the left side in the documentation of this hub. A brown washer, Type 5L, is specified for the Rollerbrake version, also installed on the left side. As long as the round, threaded part of the axle contacts the faces of the dropouts so the axle sits straight, another Shimano anti-rotation washer could probably be substituted. The dropouts of an older three-speed bicycle will need to be widened to fit these hubs. File only the bottom of the slots, so you can be sure that the axle sits straight. Dealer's manuals, user manuals and parts lists for all currently supported Shimano 3-speed hub models is accessible with this search. New developments include electrical shifting and a disc-brake version. Information on how to maintain and rebuild Nexus 3-speed hubs is in PDF documents linked below, now accessible only on the Internet Archive. Most other Nexus hubs are similar to the ones described. A video of disassembly and reassembly is available here. 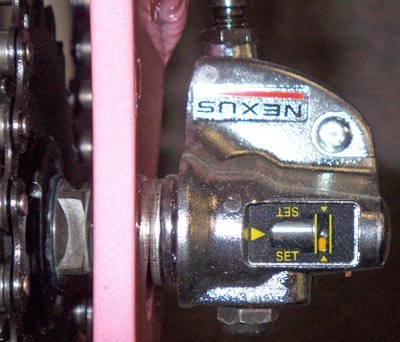 The rotary-shifting SG-3R75 uses the same CJ-NX40 cassette joint cable connection as Shimano's 7-speed hubs. Installation instructions for this hub. Anti-rotation washers are specified for both sides, and must be chosen to align the shifter assembly with the cable. See anti-rotation washer chart. Older Shimano 3-speed hubs -- Uh Uh. Stage 1: Underdeveloped country of [insert name here] uses cheap labor to make cheap, low-end products. Reputation for making cheap, inferior copies. Stage 2: Developing country of [insert name here] decides to move into higher-quality, higher-value production. Quality control and design improve, often benefiting from the advice of partners in more developed countries. Stage 4: [insert name here]'s high wages and shifting exchange rates begin to erode the competitive pricing advantage formerly enjoyed. Stage 5: Increasing quality and pricing make [insert name here]'s products un-competitive with lower-wage developing [Other Developing Country]'s output. [Insert name here] establishes partnerships in [Other Developing Country], builds factories, teaches them how to improve their quality. Stage 6: [Insert name here] can no longer manufacture bicycle parts at a competitive price, more and more manufacturing for export is shifted to [Other Developing Country]. Some high-end production for the domestic market may continue. By this time, [Other Developing Country] has hit stage 2 and will go through the same sequence over a period of years. Japan was the prototype for this sequence. Reached stage 2 in the late 1970s, stage 3 in the early 1980s, stage 4 in the mid 1980s, Stage 5 in the late 1980s and stage 6 by the early 1990s. Japanese bicycles have not been imported to the U.S. in significant number since then, though high-end, high-value Japanese-made parts are still somewhat available. The next country in this sequence was Taiwan, which hit stage 3 in the mid-late 1990s and is currently in stage 5. Following behind Taiwan is mainland China, currently (2006) in stage 3. Singapore is also in the game, for parts but not for complete bikes. Singapore has no important independent bicycle parts manufacturers, but Japanese parent companies, especially Shimano, own extensive production facilities there. Major bicycle producing countries still stuck in stage 1 include India and South Korea. Whenever India gets ready to move up, it is expected to be a very important player. Major Western European countries hit stage 6 in the late '70s, just as Japan was moving into stage 3. The original internal-gear hubs were English inventions going back to the beginning of the 20th Century. The 1936 Sturmey-Archer AW hub became the standard of the industry for the next 60 years or more. Fichtel & Sachs in Germany (now a part of SRAM) has also made reliable internal-gear hubs since early in the 20th Century. While Japan was in stage 1, in 1957, Shimano introduced the "333" 3-speed hub. It was in many ways an innovative design, and managed to avoid infringing on Sturmey-Archer's patents, but it had problems. The 333 hub was much more complicated internally than the Sturmey-Archer AW. The diameter of the hub was smaller, and so stresses on the internal parts were higher. The metallurgy of Japanese steel at that time was not up to the standards of British steelmaking, so the parts were weaker. Japanese cyclists were (and still are) lighter, on average, than Americans. The combination of design and metallurgy of the Shimano 333 hub was probably adequate for the needs of the Japanese market, but when sold in the U.S., the hub acquired a reputation for unreliability. The failure mode of the 333 hub is also different from Sturmey-Archers'. When a Sturmey-Archer AW hub gives trouble (which it rarely does) it is usually due to lack of lubrication, and one or two of the gears stop functioning reliably. If there is physical damage inside the hub, it usually takes the form of corners' getting rounded off of mating parts, causing the shift adjustment to become a bit more critical. When a Sturmey-Archer hub gives problems, it can almost always be repaired, usually without needing any parts replacement. When an older Shimano 3-speed hub fails, it is most often because one of the under-engineered pawls has shattered. The hub may still work after a fashion, so the rider continues to use it until the broken fragments of the pawls have gone on to destroy the gears and other parts, making the hub basically irreparable. In 1964, in my freshman year at Middlebury College, I was riding up the steep hill in front of the college chapel on my Columbia 3-speed -- which I had purchased new 5 months earlier. Something went "crack!" inside the 333 hub, and I felt odd, uneven resistance when pedaling. During the Thanksgiving break, I made my first visit to the Bicycle Exchange (hallowed be its memory) in Cambridge, Massachusetts, returning with a Raleigh-pattern rim and 40 spokes to lace to a Sturmey-Archer AW hub which I had salvaged from a trash pile. (The Columbia's original rim had 36 spokes). The AW hub never gave me any trouble,. The failure of a 333 hub launched my wheelbuilding career. I suppose that could be called a blessing in disguise. Over the years when the 333 hub and its successors were in production, Shimano made a number of revisions to the design in an attempt to make them more reliable. Newer, similar models are the F, FA and G type and the cartridge type, which had a pressed-in right-side ball cup instead of a threaded ball cup. Coaster-brake models were the 3SC TC-100, 3SC TC 200 and the cartridge model 3CC. The cartridge design made it easier to replace the entire internal mechanism at once -- the usual repair. The best information available on these hubs -- including comparative parts lists -- is in Sutherland's Handbook of Coaster Brakes and Internally-Geared Hubs, which is now online on this site. Sutherland's Handbook for Bicycle Mechanics, 4th edition, includes much of the same information but is now out of print. Better bike shops may have kept a copy. Glenn's New Complete Bicycle Manual also has rebuilding information. This book also is out of print, but copies are available used at a reasonable price. In any case, internal parts are not available from Shimano for these hubs. Even if you could find a source of parts, you might not get the correct generation of parts for the particular hub you have. The cartridge-type mechanism may fit into an older shell, though. Aaron's Bicycle Repair, in Seattle, Washington, USA, can rebuild these hubs. Our basic recommendation is to avoid any Shimano 3-speed hubs other than the Nexus hubs. Generally, older Shimano 3-speed hubs were only ever spec'ed in low-end bikes anyway. Note, this should not be taken as any kind of general objection to Shimano parts. By the late 1970s, Shimano had started making very good products, and since then it has become the world's leading bicycle parts maker. 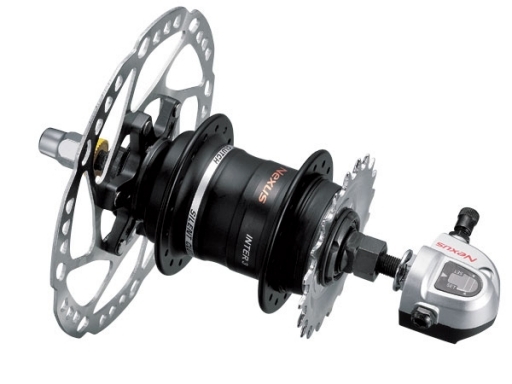 It should also not be taken as a general indictment of Shimano's internal-gear hubs. With the exception of the early 3-speeds, Shimano internal-gear hubs provide reasonable service if not abused. Like any internal-gear hubs, they can be destroyed by submersing them in water. Shimano Nexus technical documents (some). Others are only in the Internet Archive now and are linked above.